HOUSTON  (September 20, 2011)  The mercury wasn't the only thing that soared in the month of August in Houston. Single-family home sales shot up more than 30 percent when compared to August of last year. However, as has been the case for the past several months, the rosy performance took on added luster as a result of last year's third quarter slowdown in home sales following expiration of the 2010 tax credit. That credit pushed local real estate transactions that otherwise might have taken place later in the year into the first two quarters of 2010. August marked the third consecutive month of increased sales and the fourth time in 2011 that sales volume entered positive territory. According to the latest monthly data prepared by the Houston Association of REALTORS® (HAR), August sales of single-family homes climbed 30.2 percent versus one year earlier. This increase follows home sales gains recorded in January, June and July of this year. All segments of the housing market, from the sub-$80,000 to the $500,000 and above, experienced positive sales in August. On a year-to-date basis, sales rose 1.8 percent. Compared to August of 2009, a year with no unusual market influences such as Hurricane Ike in 2008 and the 2010 tax credit, single-family home sales were up 10.4 percent. "The Houston real estate market's vital signs appear to be quite healthy as we move from the summer buying season into the fall, but we must remain mindful that we are still comparing 2011 home sales to that period last year when transactions slowed dramatically after the tax credit expired," said Carlos P. Bujosa, HAR chairman and VP at Transwestern. "It is encouraging to see how well the August numbers stack up against August of 2009, which was the last 'normal' year for our housing market." The average price of a single-family home rose 0.7 percent from August 2010 to $217,047, the second highest level for an August in Houston. The August single-family home median pricethe figure at which half of the homes sold for more and half sold for lesswas statistically flat at $159,000. Foreclosure property sales reported in the Multiple Listing Service (MLS) increased 26.2 percent in August compared to one year earlier, suggesting added interest in investment-related home buying. Foreclosures comprised 19.8 percent of all property sales, which is consistent with the levels it has maintained since May. The median price of August foreclosures declined 5.4 percent to $80,375 on a year-over-year basis. August sales of all property types in Houston totaled 6,524, up 29.0 percent compared to August 2010. Total dollar volume for properties sold during the month soared 29.4 percent to $1.34 billion versus $1.03 billion one year earlier. The month of August brought Houston's overall housing market positive results when all sales categories are compared to August of 2010. However, as HAR has noted for the past several months, sales volume gains were distorted by the 2010 tax credit that resulted in a decline in home sales following its expiration. Total property sales and total dollar volume rose on a year-over-year basis. 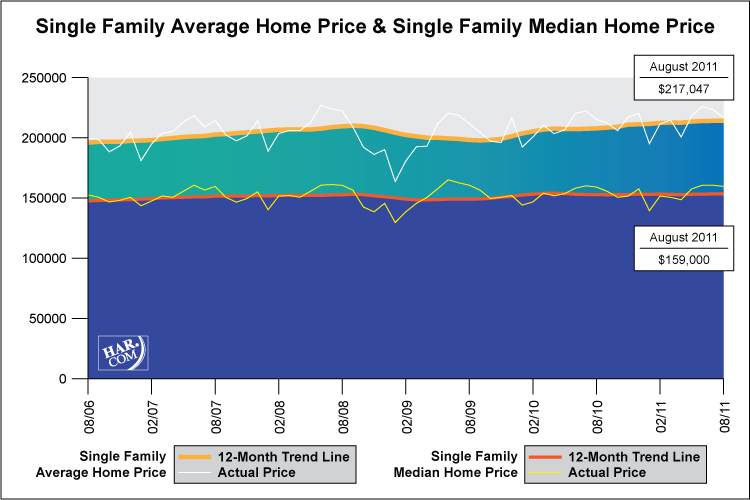 The average price rose while the median price held steady. Month-end pending sales for August totaled 3,970, up 21.0 percent from last year. The rate is slightly above levels typically observed during the late summer home sales period, continuing to reflect the rapid pace at which 2010 sales went under contract prior the tax credit closing deadline. The number of available properties, or active listings, at the end of August declined 11.5 percent from August 2010 to 48,752. The inventory of single-family homes was reduced to 7.1 months compared to 7.8 months one year earlier. That means it would take 7.1 months to sell all the single-family homes on the market based on sales activity over the past year. The figure is significantly better than the national inventory of single-family homes of 9.4 months reported by the National Association of REALTORS® (NAR). August sales of single-family homes in Houston totaled 5,543, up 30.2 percent from August 2010. This marks the fourth increase of the year after an 8.4 percent gain in January, and 1.1 percent and 14.9 percent increases in June and July, respectively. The August number represents the second highest sales volume month of the year. June was higher with 5,601 homes sold. On a year-to-date basis, sales are ahead 1.8 percent. When compared to August of 2009, a year in which there were no unusual real estate market effects such as Hurricane Ike in 2008 and the 2010 home buyer tax credit, single-family home sales were up 10.4 percent. Broken out by segment, August sales of homes priced below $80,000 skyrocketed 45.4 percent; sales of homes in the $80,000-$150,000 range climbed 26.2 percent; sales of homes between $150,000 and $250,000 increased 35.8 percent; sales of homes ranging from $250,000-$500,000 advanced 32.5 percent; and sales of homes that make up the luxury marketpriced from $500,000 and upjumped 22.4 percent. The average price achieved the second highest level for an August in Houston. At $217,047, the average price of single-family homes rose 0.7 percent compared to last August. The highest August level historically was $222,638 in 2008. At $159,000, the median sales price for single-family homes was statistically flat versus August 2010 and down fractionally from June and July's $160,000 level, which was the highest median price of 2011 and the highest level in two years. The national single-family median price reported by NAR is $174,000, illustrating the continued higher value and lower cost of living available to consumers in Houston. HAR also breaks out the sales performance of existing single-family homes throughout the Houston market. In August 2011, existing home sales totaled 4,720, a 34.4 percent hike from August 2010. The average sales price climbed 1.4 percent to $206,478 compared to last year and the median sales price of $149,000 reflects an increase of 1.0 percent. The number of townhouses and condominiums that sold in August jumped 19.5 percent compared to one year earlier, marking the third sales increase of the year. The first was a 14.7 percent rise in January, followed by a 25.3 percent increase in June. In the greater Houston area, 460 units were sold last month versus 385 properties in August 2010. The average price rose 3.0 percent to $156,522 from August 2010 to August 2011. The median price of a townhouse/condominium dipped 0.8 percent to $120,000. High demand for lease properties persisted throughout the Houston market in the month of August. Single-family home rentals jumped 21.8 percent compared to one year earlier and year-over-year townhouse/condominium rentals rose 23.1 percent. HAR has reported for several months that this demand has been largely driven by steady improvement in local employment numbers, with REALTORS® observing a surge in consumers relocating to Houston from around the U.S.
7.1 months inventory of single-family homes compares favorably to the national average of 9.4 months.